Pearls are organic gems, produced in pearl oysters. Pearl oysters are not edible, and edible oysters do not produce gem quality pearls. When an irritating foreign particle becomes lodged within the oyster, it responds by covering the irritant with iridescent layers of nacre, a variety of calcium carbonate. Eventually, these layers build up to form a pearl. There are a number of different types of pearls that are differentiated on basis of their origin. Akoya Pearls are cultured saltwater pearls which are cultivated from the species Pinctada fucata martensii, primarily in Japan and China. This was the first pearl to be cultured in a commercially accessible way. Black Tahitian Pearls are produced in the black-lipped oyster (Pinctada margaritifera) This oyster is incredibly large, often measuring 12 inches across and weighing up to 10 pounds. It is found in French Polynesia and produces pearls with a naturally dark color. South Sea Pearls are the largest cultured pearls in the world. They range in size from 9 to 20mm. The oyster that produces these pearls is called Pinctada Maxima. They live between the northern coast of Australia and the southern coast of China. Freshwater Pearls are harvested from mollusks that live in lakes and rivers. China has been utilizing freshwater pearls since 2200BC. Fresh water pearls are not bead nucleated, they are created by implanting muscle tissue into the mollusk. These pearls are solid nacre. Within the last 10 years, the quality of freshwater pearls has become so high that some may be indistinguishable from their saltwater relatives. Keshi Pearls form in either saltwater or freshwater pearls. They are solid nacre and usually extremely lustrous. They form when an oyster rejects and discards the implanted nucleus before the culturing process is finished, or separate pearl sacs form that do not have nuclei. These pearl sacs ultimately create pearls without a nucleus. Keshi means "poppy seed" in Japanese, and these pearls are sometimes referred to as "poppy seed pearls." Mabe Pearls are grown on the inside of the oyster's shell as opposed to inside muscle tissue. They are normally shaped like hemi-spheres with a flat back. They occasionally occur naturally, but most are cultured. 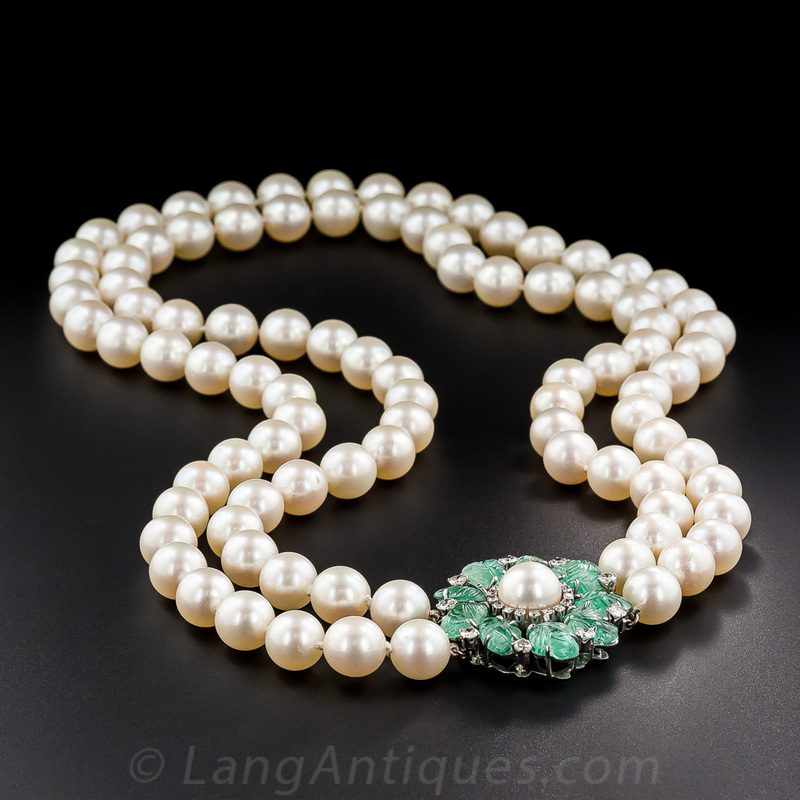 For centuries, the Persian Gulf was the main source for pearls in the world. Records dating from 2300 BC document pearls as prize possessions of Chinese Royalty. In Egypt, mother-of-pearl was used as early as 4000 BC, but actual pearls are not documented until approximately 5BC. The ancient Greeks and Romans valued pearls as symbols of wealth and prosperity. The most enduring legend concerning pearls is the story of Cleopatra dissolving pearls in the wine she drank in Mark Antonys presence. This is an unlikely scenario, as anything that would dissolve a pearl would not be safe to drink. In the beginning of the 1900s, it was discovered that a spherical bead could be placed in an oyster, and pearls could be cultured. This made pearls available to the general public for the first time in history. Pearl culturing eliminated the need for pearl divers, and replaced them with pearl farmers. Pearl is a birthstone for June and commemorates the 3rd and 30th Anniversary. It is the gem for Sunday. Pearls can attune the wearer to the ebb and flow of life. They are calming and centering. Pearls promote purity, faith, charity, personal integrity, truth and loyalty. Peals have always been associated with "ultimate" feminine energy. Pearls have routinely been used to treat disorders of the muscular systems and digestive tract, as well as to assist in problems with fertility and to relieve discomfort in childbirth.